"THERE'S been an explosion," called the man, as the last sound of a couple of nerve-racking crashes died away. A group of miners stood watching and waiting at the entrance to a labyrinth of tunnels as the man hurried forward. "I don't know any more," he told one of the miners who asked for more details. "All I know is there has been an explosion." The miner who asked the question was obviously the leader of the group waiting for more news. He turned to the underground telephone and without a sign of panic or stress, told the pit-head what had happened, and what he and his men were going to do - go to the scene of the explosion and bring out anyone they found. Quickly the rescue team began to prepare their breathing apparatus, charged with liquid oxygen and strapped to their backs. Filled with dense smoke, the tunnels would soon choke a man to death unless he had some means of breathing in that dark mirky atmosphere. Then, with the beams from their helmet lamps, making only a small impression on the wall of smoke and darkness, they walked into the tunnel carrying a stretcher and resuscitation equipment. This was the beginning of an exercise at the Ilkeston Mines Rescue Station, which last week was putting a team of miners from Gedling Colliery through a series of tough tests. There was no real explosion of course, only the sound effects, but the tunnels, the dense smoke, the breathing equipment, were real enough. It was not the kind of smoke test which could be taken lightly. And the men being trained could be called on at any time to help in the kind of rescue operations which took place recently at Lofthouse Colliery, near Wakefield, where seven miners lost their lives. As a journalist, and uninsured and untrained for this type of exercise, I was not allowed to take part in the "rescue" at Ilkeston. But seeing the men before and after their ninety-minute long test it was possible to get a good idea of the difficulties and hardships of rescue operations sometimes more than a mile underground. The final stretch of tunnel through which they had to pass was only about three feet high, and only wide enough for one man to pass. With 30 pounds of breathing equipment on their backs they had to half drag, half carry the stretcher on which a "casualty" - one of the staff of the rescue station - was strapped. The men's nostrils had clips on them to prevent the smoke getting into their throats and their mouths were covered by the mouthpieces supplying them with Oxygen. They looked like a group of aqua-lung swimmers exploring some deep sea caves as they appeared, their helmet lamps bobbing around through the smoke-laden tunnel. And they were wet when they finally emerged - with sweat. As they came along the passage the sound of their rubber- bulbed hooters, attached to straps on their chests and used for communication, was clearly audible. Earlier, this group of men had been sweating again as they underwent the vigorous Harvard pack test, which each one has to pass to prove his fitness as a member of the colliery rescue team. For this test - designed originally to test athletes at America's Harvard College - a man has to carry a third of his body weight placed in leather bags slung across his shoulders. To the time of metronome ticking away at one second intervals he then steps up and down on a step 16 inches high for five minutes. Stretching well outside the boundaries of the rescue centre a network of underground tunnels in which a variety of incidents are simulated to put rescue teams through their paces. Fires are started, which the men have to fight, dense smoke spread through every passage, falls of rock are strewn across an exit point, l3-stone dummies are left covered by rock and dust, to see if the team can find and bring out accident casualties. In one section the heat and humidity can be increased as men build up a wall of sandbags - the kind of operation which might be needed to seal off a tunnel to prevent fire spreading through the pit. Men working under very hot humid conditions tend to collapse with heat stroke after a certain time. The leader of a colliery rescue team, called the captain, equipped with an instrument called a hygrometer and a time chart, has to make sure that his men are out of the chamber before the safety limit is reached. These are the kind of conditions which could be caused, for example, by the heat and steam which comes when perhaps thousands of gallons of water are being hosed on to a fire underground. Gas is another hazard for the miner, either from noxious fumes or the dangers of explosion. 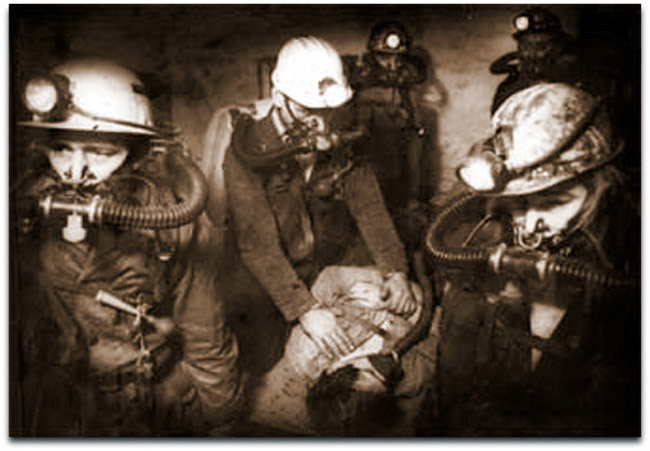 Efficient ventilation, constant safety checks, the flame safety lamp, based on the old Davey Lamp priciple, and the gas masks known as self-rescuers that all underground miners carry, have cut down the risks considerably. But accidents still happen, usually because of a combination of mistakes rather than any single error. It came as a surprise to someone like myself, who is new to a mining area, to discover that canaries are still used to detect gas in pits. The rescue centre at Ilkeston has an aviary with 15 birds, each of which has a week on duty when it can be called on to help in rescue operations. Contrary to what is sometimes believed, the canaries are not, allowed to die when they are carried into a carbon monoxide atmosphere. At the first signs that the bird is tottering on its perch, because of the fumes, the man carrying the cage draws back and only men equipped with breathing apparatus carry on. Rescue teams also have chemical equipment to test the atmosphere - but so far, no one has been able to invent a mechanical canary as constantly alert as the real thing. The Gedling team being tested last week were just one of the rescue units, based at each colliery, made up of from five to eight miners, who undergo regular physical and rescue training. Forty-eight-year-old Supt.Crispin Hodgkiss. who took charge of Ilkeston station in August, has been involved in dozens of rescues down mines during his career. "I always keep my keys in my pocket," he says. "You never know when you are going to get home on this job."